This Villa is a serene riverside sanctuary situated a few kilometres from the spectacular Tanah Lot sea temple on Bali’s glorious ‘sunset’ coast. This elegant villa comprises four air-conditioned bedrooms. This villa is a riverside paradise situated a few kilometres from the spectacular Tanah Lot sea temple on Bali’s glorious ‘sunset’ coast. Offering five private and luxurious bedrooms. This double pool 2 bedroom villa is located in the best position on the Greg Norman designed Nirwana Golf Resort, offering stunning panoramic 270degree views of the Indian Ocean, green fairways, beachfront and spectacular Balinese sunsets. This double pool 3 bedroom villa is located in the best position on the Greg Norman designed Nirwana Golf Resort, offering stunning panoramic 270degree views of the Indian Ocean, green fairways, beachfront and spectacular Balinese sunsets. This double pool 4 bedroom villa is located in the best position on the Greg Norman designed Nirwana Golf Resort, offering stunning panoramic 270degree views of the Indian Ocean, green fairways, beachfront and spectacular Balinese sunsets. Imagine yourself, after a game of golf on one of Asia’s best courses, sitting on the large veranda of this luxurious 4 bedroom villa, sipping on a cold drink watching the sun go down over the large waves pounding the west coast of Bali. This 3 bedroom Oceanside Villa is uniquely situated within the Bali Nirwana Golf Course along the stunning Indian Ocean on the mystical Island of Bali. The villa captivates you with lush vibrant tropical gardens facing the expansive ocean view. This 3 bedroom property is an absolute oceanfront villa with panoramic views of the Indian Ocean and the famous Greg Norman designed golf course. Located only 25 minutes to the shopping and restaurant district of Seminyak. This luxury 2 bedroom villa offers panoramic views of the Indian Ocean, golf course and spectacular sunsets. 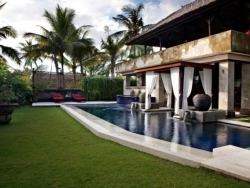 Designed in classical Balinese style and the ultimate in luxury with an outdoor living pavilion and private plunge pool. 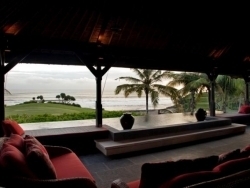 This luxury villa offers panoramic views of the Indian Ocean, golf course and spectacular sunsets. Designed in classical Balinese style and the ultimate in luxury with an outdoor living pavilion and private plunge pool. This luxury 4 bedroom villa set within the stunningly beautiful 100 hectare Nirwana Bali Golf and Spa resort. Overlooking the prestigious Greg Norman signature golf course it is suitable for families or couples seeking beauty and tranquillity. This 3 bedroom bedroom is a 45 minute drive from Bali’s international airport and 25 minutes from Seminyak perfect for couples and families and for those who simply wish to enjoy the peace and seclusion of Bali. This 3 bedroom villa is an exclusive private villa, exquisitely designed and decorated situated on the 100 hectare Nirwana Bali. 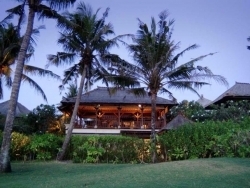 The villa overlooks the Indian Ocean and the famous Greg Norman designed golf course.